Awoke and thought how good the weather looked – the forecaster last night had said that it was all downhill for the rest of the week, with today as the worst of all. Well, it was really rather pleasant (a little bit cold, perhaps) as I walked Mix. Came home and breakfasted at the farmhouse and as I was drinking my coffee (having scoffed the bacon, egg and fried bread) Tom arrived and demanded that I went back to work on the summer house. 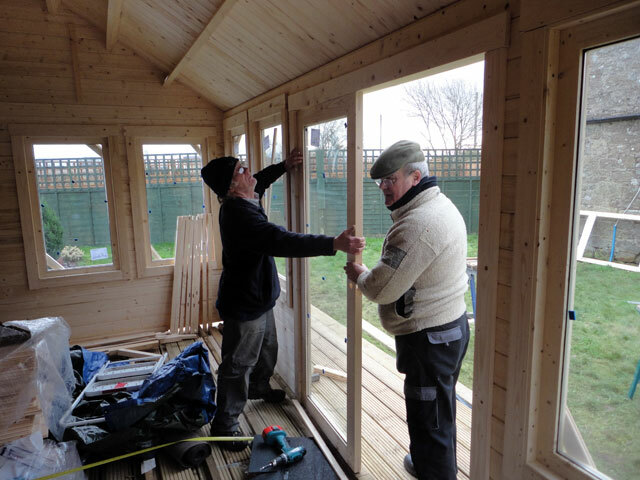 ‘There’s lots to do, and the weather is OK.’ So we set about fitting all of the windows (albeit in a temporary fashion because the ironmongery for six of them was missing. I’ve reported it and am waiting for it to arrive.) We also hung the door and did all that was necessary to ensure that everything was plumb. Actually that short sentence took a long time to achieve. It was mid afternoon, with darkness already beginning to fall before we had everything done. All that remains (apart from the window fittings) it to fit the shingles on the roof (no hurry now that we have it all covered with roofing felt), the laying of the floor, the electrics and the varnishing. It will be done by the end of the year. Looking back over my diary entries for the last few days I realise how fixated I have become on this summerhouse. I suppose that is a real novelty for me. I've never had the time to become totally engrossed in something like putting up a small building; of working away at something which in itself is quite trivial, which isn't part of work but which is just absolutely great fun -- and as Tom said today, we're getting quite a sense of achievement as we see the little building taking shape. Came back in and found an email with the list of music for Arrochar’s Sunday service. Got it all prepared and emailed to Jamie so that he has time to test it all before Sunday. Then I drove Mum into Duns where she is attending the Dun’s Guild Christmas party which she will enjoy. Back at the farmhouse, I enjoyed sausages, broccoli and roast potatoes followed by rhubarb tart and custard with ice-cream. I think that I probably over ate. Came back home in time to watch the second part of ‘Lucan’ – the events surrounding the disappearance of Lord Lucan in 1974 – events which I missed because I was working in Italy at the time. The weather is starting to turn nasty after all – a wind has blown up and there is rain in the air but not nearly as bad, so far, as I had been expecting. Found the second part of the play about Lord Lucan quite disappointing except for the fact that one of the minor characters in it was played by one of Rachel’s former students from Fife College. All the play said was he could have committed suicide, he could still be free or perhaps he was murdered – well, even I could have worked that out; but perhaps there was nothing else that could have been said. I recorded the first part of the Great Train Robbery play in two parts – The Robber’s Tale tonight and tomorrow the Policeman’s Tale. What a strange coincidence that Ronnie Briggs should die today. Of course, as Tom reminded me today, Ronnie Biggs had a very minor role in the Train Robbery. I know that some people admired the audacity of the train robbers, I find it hard to have any sympathy for them because of the what they did to the guard on the train, hitting him so hard that his life was destroyed – still the jokes have already started: In those days people stole from the banks, now the banks steal from us! Which leads me to my final musing, why do authorities fine banks for doing wrong? And who benefits from the fines which are collected? Surely it would be better if the money confiscated was distributed to those who have been harmed by the wrong-doing, but in fact if our bank treats us badly and is fined, then we are affected for a second time by banking with a bank which now has less resources and so can provide us with less services. The world has become a strange place. We walked the dogs and by now the weather had turned really stormy. It was still dry but the winds are very strong. The promised horrendous weather looks as if it is arriving – hope the summerhouse is still there in the morning!